Love your job, work from home and be your own boss. Are you creative, driven and passionate about healthy living? Inspire others to make choices that benefit themselves and the world around them by becoming a Natural Awakenings publisher. The Gulf Coast Alabama/Mississippi edition is for sale. This is a meaningful home-based business opportunity that provides extensive training and ongoing support. No previous publishing experience is required. Our unique approach is non-invasive and has helped dementia patients that originally scored in the teens on the Montreal Cognitive Assessment be restored to the point of scoring normal (26-30) on the same assessment. Contact us today to schedule a comprehensive neurological evaluation (includes Quantitative EEG) to identify the potential for brain pathway improvement. Once a treatment program is put in place, many patients see notable improvements within a few weeks, but the benefits can last a lifetime. Dr. J Douglas Brown DC DACNB, Board Certified Neurology-Chiropractic Dr. Brown is one of only a few functional neurologists in the U.S. providing brain pathway activation therapy in conjunction with deep transcranial magnetic stimulation (TMS) and Bredesenâ&#x20AC;&#x2122;s science-based nutritional program. First appearances matter in your personal life, your love life and your career. Come see us—you’ll be so glad you did. ADVERTISING & SUBMISSIONS HOW TO ADVERTISE To advertise with Natural Awakenings or request a media kit, please contact us at 251-990-9552 or email Publisher@HealthyLivingHealthyPlanet.com. Deadline for ads: the 10th of the month prior to the month of publication. EDITORIAL SUBMISSIONS Email articles, news items and ideas to: Publisher@ HealthyLivingHealthyPlanet.com. Deadline for editorial: the 5th of the month prior to the month of publication. 103A N Bancroft St, Downtown Fairhope, AL ”Rock”-ins welcome! CALENDAR SUBMISSIONS Submit dated and ongoing calendar events online at HealthyLivingHealthyPlanet.com. Deadline for calendar: the 10th of the month prior to the month of publication. REGIONAL MARKETS Advertise your products or services in multiple markets! Natural Awakenings Publishing Corp. is a growing franchised family of locally owned magazines serving communities since 1994. To place your ad in other markets call 239-434-9392. For franchising opportunities call 239-530-1377 or visit NaturalAwakenings.com. SUBSCRIPTIONS Subscribe to the free digital magazine at HealthyLivingHealthyPlanet.com. Mailed subscriptions are available by sending $30 (for 12 issues) to the above address. 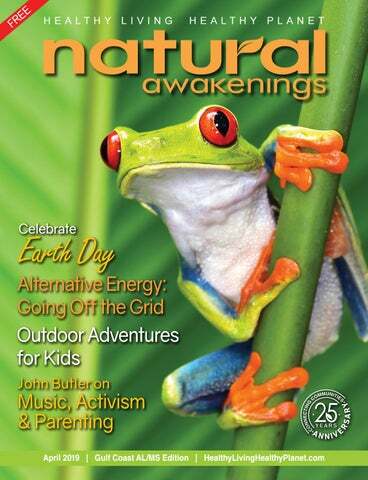 Natural Awakenings is printed on recyclable newsprint. A Natural Neuropathy Treatment that Works Spencer Chiropractic, in Gulfport, offers K-Laser therapy as a natural neuropathy treatment. This drugfree solution does not involve injections or surgery and is proven in clinical studies to be 90 percent effective in the treatment of neuropathy symptoms. An estimated 42.5 million Americans suffer from neuropathy, many of whom experience pain and loss of function so significant that their quality life is dramatically reduced. It is not uncommon for some to entirely lose feeling in their feet and hands, frequently fall because of loss of sensation and suffer debilitating pain that limits their enjoyment of life. If left untreated, neuropathy can develop into a serious disorder and lead to permanent nerve damage. Laser therapy has been used in Europe since the 1970s and was cleared by the United States Food and Drug Administration in 2002. During a K-Laser session, infrared laser light interacts with tissues at the cellular level, which promotes increased circulation by drawing oxygen and nutrients to the affected area. This creates an optimal healing environment, reducing inflammation, swelling, muscle spasm, stiffness and pain. There is little or no sensation during treatment and as the injured area returns to normal, pain is relieved and function is restored. Dr. Sonya Spencer says, “We focus on giving you better patient outcomes through clinical excellence, and we are happy to offer this K-Laser neuropathy solution.” Location: 38 Pass Rd., Ste. C, Gulfport, MS. For more information, call 228-5758660 or visit SpencerChiropractic.com. See ad, back page. Healing Acres Wellness Center, in Robertsdale, and Avalon Education & Wellness Center, in Loxley, are teaming up to offer a schedule of wellness and gardening classes this spring. With two outdoor labyrinths on site, Healing Acres will host a class on the history and how to use a labyrinth on April 20. On April 27 they will be teaching interested individuals how to preserve food from the garden. Avalon hosts doTERRA oil classes every Tuesday from 6 to 7 p.m. to educate the public on the use of essential oils. Gardening classes are coming to both locations in May and will cover topics such as herb and vegetable gardens, elderberry, tea gardens and bee keeping. Self-Treatment for Pain-Free Living Synergy Yoga & Pilates, in Mobile, hosts MELT classes at noon on Mondays and Thursdays, and at 9 a.m. on Wednesdays. MELT is a self-treatment method that restores balance in the nervous system while fostering healthy connective tissue for support and optimal mind-body communication. These practical exercises can naturally erase pain and tension in hands, feet, neck and low back caused by everyday stress, overuse, age or chronic conditions such as arthritis, bunions, plantar fasciitis and carpal tunnel syndrome. The MELT treatments, which can complement other fitness routines, are having a positive impact on practitioners in Mobile who experience the immediate effects of the method. “MELT is for anyone that wants to slow down the aging process, including older adults that want to stay active, mobile and independent, and athletes who want to achieve optimal performance without debilitating wear and tear,” says studio owner and MELT Instructor Dana Garrett. Location: 3152 Old Shell Rd., Ste. 2, Mobile, AL. For more information, call 251-473-1104 or visit Synergyoga.net and MELTMethod. com. See ad, page 16. Every Day is Earth Day at This Fairhope Salon B-Butterfly Salon, in Fairhope, recently added something new to their list of environmentally friendly practices—the recycling of the foils used in their hair color processes. By enlisting the help of a local recycler, the salon is diverting a trash bag full of foil per day from the landfill. B-Butterfly specializes in using color processes that contain organic ingredients which are better for clients’ health and the environment. Their products are not tested on animals and do not contain ammonia, SLS, plastics or parabens. With a filtered water system and filtered air, this locally-owned business is committed to providing a clean and healthy experience for the safety and well-being of their clients. ule a free hair consultation, call 251-990-9934. See ad, page 5. Alabama Healing Arts (AHA), occupational college and wellness center, is accepting applications for enrollment in all programs. AHA educators have over 25 years of teaching experience to assist students in becoming a licensed massage therapist (LMT). “Therapeutic massage is a beautiful healing practice. It makes a perfect adjunct therapy to many healthcare professions. This fulfilling career allows for great flexibility, versatility and creativity. LMTs are becoming more and more in demand each year,” says owner Kelly Laurendine. Massage classes are scheduled to begin July 8. The 650hour curriculum meets state requirements for preparing students to become licensed therapists. This interactive massage program emphasizes hands-on technique demonstration and practice, includes specialty techniques, fundamental sciences, student clinic and outreach practicum. AHA maintains a 100 percent pass rate for students taking the licensure exam. AHA also offers three levels of reiki certification that can be purchased individually. Level I will be offered April 27 and continuing education credits are available. The school’s 200-, 300- and 500-hour yoga teacher training programs will begin July 13. For more information or to apply, call 251-753-1937, email AlabamaHealingArts@gmail.com or visit AlabamaHealingArts.com. See ad, page 16. Uptail Resale, the official resale shop of the Baldwin Humane Society, is hosting an Easter Egg-Stravaganza sale from 10 a.m. to 2 p.m., April 13. Customers will enjoy a fun spin on their shopping experience when they choose an egg to win a discount on marked products. Uptail Resale is a resale boutique specializing in quality home furnishings, decor, jewelry and much more. New inventory is regularly posted on Facebook and all proceeds benefit the nonprofit organization’s mission to rescue animals in need, provide the appropriate rehabilitation and safely relocate them to good homes. “All proceeds from the Easter Egg-Stravaganza sale help us continue to care for the animals of the Baldwin Humane Society,” says Executive Director Abby Pruet. Agapé Juices, in Gulf Shores, now has smoothie bowls and they’re offering Natural Awakenings readers 10 percent off their order. Choose a nutter butter, strawberry banana or triple berry smoothie base and have it topped with healthy ingredients such as sliced fresh fruit (bananas, apples and berries), nuts (cashews, walnuts and almonds), seeds (chia and pumpkin), dates, granola, coconut, dried fruit and more. By combining high quality organic ingredients, this juice and smoothie café also serves a full menu of cold-pressed juices, smoothies, salads, wraps and snacks. Custom juices by the gallon and nut butters are available and all recipes are free of soy and canola oils. Their Kangen machine alkalizes and ionizes water, which is used to clean produce, make almond milk and enhance some of their juices. Location: 22886-D US Hwy 98, Fairhope, AL. For more information, call shop manager Vicki Garrett at 251-928-8020 or visit Facebook.com/ UptailResale. See listing, page 38. Location: 7369 Alamo Circle, Ste. C, Gulf Shores, AL. For more information, visit Agape-Juices.com. See ad, page 21. Early detection can mean life. Breast thermography is one of the easiest and safest methods for spotting inflammation, a major precursor to disease. It offers earlier detection of breast disease than self examination, doctor examination or mammography. OCEAN SPRINGS, MS YOUR MASSAGE STUDIO HERE! Our readers are looking for more Mississippi LMT’s. Advertise your massage business here. Call 251-990-9552 for SPECIAL MISSISSIPPI PRICING! ROBERTSDALE, AL HEALING ACRES Massage, Reflexology, Colonics, Reiki 22355 Price Grubbs Rd. 251-300-9052 See ad, page 27. From seed to end product, we are a family farm rooted in your health & wellness. Organic Berries, Live Music and Family Fun Weeks Bay Plantation’s Harvest Night celebrations are scheduled for April 20, May 18 and June 15. These family-friendly events kick off at 9 a.m. with blueberry picking and kids’ activities. As the live entertainment begins at 4 p.m., food trucks and a marketplace will also open. In addition to the u-pick experience, packaged berries will be for sale. “The fun will last until the final note has been sung at 8 p.m.,” says owner Tynes Stringfellow. The live entertainment for the April event will be the funky sounds of GypsySpark with Gram Rea and future acts will be announced soon. These are BYOB events and attendees should also bring their own blankets and chairs. Admission is $10 per event (kids 12 and under get in free) or purchase a Friend of the Farm Pass for $20 and gain access to all three Harvest Nights. “Plan on spending time on the farm stocking up on organic blueberries, shopping local vendors, enjoying delicious and local eats, watching the kids have a blast and listening to some amazing music under the stars,” says Stringfellow. “We can’t wait to celebrate our Harvest Nights with you.” For more information, email Jessica@WeeksBayPlantation.com, visit WeeksBayPlantation.com or find Weeks Bay Plantation on Facebook. See listing, page 37. Boost your immune system from the inside out with our elderberry line of syrup, hand sanitizer and bath products. Fun Bicycle Ride Raises Awareness The Alabama Coastal Foundation will be hosting The Good Life Ride on May 11. This scenic ride in Coastal Alabama encourages people to pause from their busy lives so they can enjoy the beautiful coastal environment on Mother’s Day weekend. Using the trails of Gulf State Park, three routes are offered—2-, 9- and 19-mile options. To celebrate the event’s tenth anniversary, The Good Life Ride is partnering with The Lodge at Gulf State Park to offer a discount on reservations for the weekend of the ride (book by April 17). The Lodge, an environmentally conscious hotel and a leader in the sustainable tourism movement, will serve as the start and finish of the routes, as well as the location of the post-ride party. Registration includes the ride, plus complimentary food and two drink tickets at the after-party. Proceeds benefit a bicycle safety campaign. For more information, call 251-990-6002 or visit GoodLifeRide.org or ImAthlete. com/events/2019GLR. OsteoStrong is unique because it delivers massive physical performace gains with minimal effort. It’s the Ultimate Biohack. 60 seconds of effort once-a-week improves balance, posture & strength. It’s time to dump your diet. Diets aren’t fun and they aren’t sustainable because they never deal with the reason people become overweight. People don’t overeat because they’re hungry. They overeat because they want to change the way they feel. Change the way you think today. See if you can be accepted into a hypnosis program to lose weight. 20% OFF Garden of Life, New Chapter & Nordic Naturals everyday! 15% OFF all non-sale supplements every Sunday! All Michael’s, Host Defense and Renew Life Products! SHOULD YOUR YOGA BUSINESS BE ON THIS PAGE? Ask about special rates for Mississippi studios. Ads include calendar listings, Facebook marketing and editorial coverage. that resolves physical discomfort, releases tension and alleviates pain while restoring flexibility and enhancing energy. Chemicals used in dry cleaning clothes have long been linked to health concerns for both people and the environment. Perchloroethylene (“perc” for short) is most commonly used in this process. Federal regulatory agencies have documented myriad negative effects from exposure to the petroleumbased solvent. The U.S. Occupational Safety and Health Administration links it to dizziness, blurred vision, loss of coordination and other nervous system effects, including memory loss. The U.S. Environmental Protection Agency calls perc a likely human carcinogen “by all routes of exposure.” The EPA also warns that the chemical can leak into the ground, contaminating water supplies, and react in the air to form smog, which has been associated with respiratory effects. Earthtalk.org suggests there are safer alternatives through products and processes used by independent “green” dry cleaners nationwide. These include a biodegradable liquid silicone—essentially liquefied sand— which doesn’t chemically react with fabric fibers. It’s safe to use on delicate garments like beads, lace, silk and cashmere, and won’t cause shrinkage. GreenEarthCleaning.com includes a store locator function. Another good option is wet cleaning, whereby fabric is laundered in a computer-controlled washer and dryer that uses water—along with specialized soaps and conditioners instead of solvents—and spins its contents much more slowly than a typical home washing machine. Because wet cleaning is free of hazardous volatile organic compounds like those in perc, it eliminates health and safety risks, as well as environmental hazards associated with traditional dry cleaning, according to GreenAmerica.org. As an added benefit, the equipment and operating costs are lower. While the biggest disadvantage to wet cleaning is that it produces waste water, it’s still a highly energy-efficient method. Another method is liquid carbon dioxide (CO2) cleaning, in which some commercial cleaners use the pressurized gas in combination with other gentle cleaning agents to dissolve and remove dirt, fats and oils in clothing instead of using perc; or consider simply handwashing delicate clothes and fabrics in a mild, non-toxic detergent, and then hanging them outside to dry. It gets you better, not high. 12% OFF 1 CBD Item Must present coupon. Expires 4/30/2019. 30-40% faster decline in cognitive abilities than their peers with normal hearing. Get an annual hearing screening once you reach age 50. Call (251) 517-4938 today to schedule your NO CHARGE Hearing Consultation! airhope Health Foods employees smile when they hear customers say, “We love your new expansion!” When you walk through the new double-door entrance, the updated space does feel bigger, but in reality, it’s not. “It shows you how much good lighting, fresh color and views to the outdoors can transform your experience of a space,” says architect and owner of WATERSHED, Rebecca Bryant, who guided the design of the store’s recent renovations. Fairhope Health Foods, the first health food store in Lower Alabama, opened in 1975. Along with Virginia’s Health Foods (their sister store in Mobile), they are known for excellent customer service and expansive product inventory. In addition to supplements and health foods (including fresh, organic produce), the stores stock a variety of products that include natural cosmetics, natural pet food and products, eco-friendly cleaning supplies and fair trade gifts. Bryant has been working on plans for their remodel with owner Lynnora Ash since 2017 and construction started around Thanksgiving of last year. “It’s like we do with our bodies—you say you want a healthier, newer you. That’s what we wanted for our store,” says Ash. This health-centered mission inspired Bryant to focus on two strategies—active design (which promotes physical, mental and social well-being) and biophilia design (which connects people to nature). construction. The implementation of a green cleaning program for after construction is also required by the certification. To foster the health of their staff, the break room was made more private and includes an area for breastfeeding employees that need to pump, plus space for everyone to store their own fresh foods. Better ergonomics is a priority that influenced the addition of sit-to-stand desks. Accessibility upgrades for disabled customers and employees (including restrooms) is a part of Fitwel’s standards and something Ash emphasized early in the process. Since moving to their current location in 2001, they have expanded several times. “That’s why there were poles in the middle of some of the aisles—the current space used to be three separate stores. Lynnora started in one of the spaces and expanded her store into two more,” explains Bryant. By shifting the aisles so the poles are no longer blocking the path, they appear wider and are now more accessible for wheelchairs. the mirrored tint on the storefront windows was replaced with a transparent, energy efficient window film that reflects heat. A louvered screen wall made out of naturally weathered cedar is also being installed. “The west-facing windows act as an oven in the afternoon and the wooden screen filters the strong afternoon light while still allowing people to see in and out of the store,” says Bryant. “We also looked for opportunities to introduce natural materials because people respond physically and emotionally to them like they respond to views of nature.” The base of the checkout counter will mimic the window screen with the same maple and the top is granite. To reduce waste they used existing shelving but updated their look by painting the backboards black and enlisting a local cabinet maker to build endcaps with another natural material—maple. In addition to switching to highly efficient LED light fixtures that are closer to the color temperature of sunlight, highly-reflective paint colors were used on the walls. Compared to the previous earth tones, the color palette is simpler but the walls are more dynamic, since they react to natural light as it changes throughout the day. A green screen of vines outside the store will soften the views of the parking lot and create better outdoor seating for the Sunflower Café next door. This element will also establish a visual identity for the store so they are more easily identifiable in the long retail strip. Additional standard practice environmental improvements include enhanced energy efficiency via new insulation that is formaldehyde-free and high in recycled content, plus the installation of Water Sense certified plumbing fixtures. Ash was immediately rewarded for the energy and water conserving updates with a savings of approximately $1,000 on her monthly utility bill. Supporting Community Bryant acknowledges the community that Ash has built around the store and café, noting, “Her customers really feel at home here— someone said walking into the store was like walking into ‘Cheers’ and I love that. It was important that this renovation was more than retail design; it was design to support that community.” The store remained open during the entire renovation process and Ash expresses immense gratitude for the patience of everyone involved. “Our customers have been so supportive and complimentary along the way. They appreciate the green choices we made and were impressed that there were no toxic smells with all that was going on,” she says. “Some came into the store even when they didn’t need anything, just to see what was new since their last visit.” Ash and her staff have prioritized the health of their customers for more than four decades. This renovation not only supports that commitment, it demonstrates an elevation in their wellness standards that will likely have an impact beyond the store’s walls. Fairhope Health Foods has raised the bar for smart design, and we look forward to seeing how their actions and intentions inspire others community-wide. Location: 280 Eastern Shore Shopping Center, Fairhope, AL. For more information, call 251-928-0644 or visit Va-FairhopeHealthFoods. com. See ad, page 15. He also encourages his son and daughter to find a form of self-expression that they love as they navigate their teen years. “I want them to have a friend in something they can do on their own,” he says. “Whether it’s making something with their hands, playing music, sewing—there’s something really beautiful about escaping with yourself and your tools, something you can’t get with anybody else.” For Butler, his guitar is that unwavering companion. While making his latest album, Home, a flood of emotions and anxieties surfaced once he stopped touring. “Bringing a song into the world is an enlightening process, and each one demands different things from me,” he says. He worked through intense introspection, which was challenging yet therapeutic and productive. “Throughout the years that it took to make this album there were tears and frustration, confusion and chaos. But, there was family and friends, honesty and vulnerability, gardens and harvest, service and surrender. And amongst it all, ultimately, there was joy,” Butler reflects. To balance the demands of his career, Butler leans on family and friends for love and laughter, plus skateboarding, running and meditation to clear his mind. He regularly seeks solace in nature and is also very spiritual. Traveling with a portable altar while on tour, he carries a collection of tokens from his ancestors, candles, photos, feathers and sage—bits and pieces that represent the tapestry of his faith. “I am struck by spirituality’s ability to bind cultures in story, song, ethics and morals for generations to come, so we can somehow make life a little bit more doable,” he says. Butler’s music and actions have a similar effect on the audiences it touches. The band’s deep layers of chant-like vocals and heart-pounding drums can bring a sea of strangers together in song and dance, while the words he speaks and the life he leads inspire reflection and action by multiple populations. He’s doing more than his job—he’s cultivating hope and awareness on a global level. 3 flavors + many toppings available! hair services|facials|massage ON BOTH SIDES OF THE BAY! Are you looking for guidance? Or to connect with a departed loved one? Achieve clarity, understanding & direction with a reading. Treat your locavore palate to farm-fresh foods that contribute to a healthier planet and a more prosperous local economy. Support these Gulf Coast businesses! An urban container farm offering year-round produce subscriptions of pesticide-free, hydroponically-grown lettuces, herbs and seasonal vegetables. Pick-up locations in Mobile, Irvington and Fairhope. See ad, page 24. 20733 Miflin Rd. (Co. Rd. 20), Foley, AL 251-709-4469 CoastalAlabamaMarket.com Open year round Tuesdays (10am-3pm, NovMar. 2-6pm, Apr-Oct.) and Saturdays (9am-2pm). Local farms with seasonal produce, beef, pork, lamb, chicken, eggs, honey, jellies, baked goods, seafood, hand-crafted soaps and more. Follow us! Facebook, Twitter, Instagram, Pinterest. Jones Park Pavillion, Highway 90 Gulfport, MS • 228-257-2496 Open year round on Wednesdays from 9am-1pm. For more info: Facebook.com/GulfportHarborMarket. Joanie Stiff, Market Coordinator Mobile, AL 251-208-1550 • SpecialEventsMobile.org 2019 Markets: Saturdays in Cathedral Square from 7:30 a.m. to noon (April 27 to July 27; October 12 to November 23). Thursdays in Lavretta Park 3 to 6 p.m. (May 31-Aug 1). See ad, page 35. Summerdale, AL EndOfTheRoadFarm.AL@gmail.com We carry a variety of goods from our farm and other local farms based on season and availability. Email for a list of what’s currently available. Natural Elder Products Lucedale, MS 601-791-0943 • 601-947-7692 Discvree7@gmail.com Boost your immune system with locally-made natural elderberry products including syrup, hand sanitizer and bath products. Also offering arnica products for pain relief and seasonal produce. See ad, page 11. 280 Eastern Shore Shopping Center Fairhope, AL • 251-928-0644 Va-FairhopeHealthFoods.com Comprehensive health food store featuring local products: organic produce, meat, eggs, honey, soap and more. See ad, page 15. Comprehensive health food store featuring local products: organic produce, meat, eggs, honey, soap and more. See ad, page 15. 320 Eastern Shore Shopping Center Fairhope, AL • 251-929-0055 Va-FairhopeHealthFoods.com Organic cafe serving lunch Mon-Sat and Sunday brunch. We use locally-grown produce, herbs and meat. See our six-page menu online. See ad, page 15. 3055 A Dauphin St., Mobile, AL 251-479-3200 Va-FairhopeHealthFoods.com Organic cafe and juice bar serving lunch MondaySunday (brunch specials on Sundays). We use locally-grown produce, herbs and meat. See our six-page menu online. See ad, page 15. 12562 Mary Ann Beach Rd., Fairhope, AL 251-279-8745 WeeksBayPlantation.com Weeks Bay Plantation/LA Berry Farms is the regional destination of choice for pick-your-own blueberries, herbs and heirloom tomatoes—all organically grown. Check website for picking dates and greenhouse sales. esse Stafford and Alyssa Craft quit their jobs in 2015, bought five acres of remote land far away from utilities and began building their 36-foot-by-36-foot timber frame home from scratch. Next up was a septic system, then a clean water source and, of course, alternative energy. Their rooftop solar panels are backed up by a reliable Honda generator. They had some setbacks, which is to be expected. Now they’re blogging about it. “We didn’t want corporate jobs, we didn’t want to live in the city, commute to work or have a mortgage payment,” they write in their online homestead journey at PureLivingForLife.com. Off-the-grid living has become downright fashionable, especially for the eco-conscious. But leaving the rat race isn’t easy, and it’s not for everyone. Yet, anyone that wants to become more energy-independent can succeed without moving to an isolated cabin; and there’s never been a better time, because prices keep coming down and technology keeps improving. Choosing the best option depends on several factors, including the specific residence, climatic zone, town and neighborhood. by adding up the wattage of all appliances, and then add 50 percent. The American average is 10,000 kilowatt-hours annually, although frugal folks can make do with less. The local utility company can also estimate energy needs based on past usage. Realize that alternative energy doesn’t need to be an all-or-nothing proposition. For instance, a solar system doesn’t have to power the whole house. A smaller and cheaper array with battery backup can be connected to essential services like the water heater, refrigerator and electric stove, with the grid handling heavier loads. Advantages are lower upfront cost and access to the grid when needed. Connecting to the grid makes sense for all alternative power sources, because wind and solar are intermittent, and don’t always provide power. Also, most states offer net metering, which requires the local utility to pay for the electricity a homeowner puts back into the grid. Fairfield, Connecticut, serves on his town’s sustainability task force and “went live” with his rooftop installation six years ago. “It’s turned out to be one of the best investments we’ve ever made—financially and environmentally,” he says. The U.S. Department of Energy (DOE) is working toward residential solar to generate power at just five cents per kilowatthour by 2030, which means it will be far cheaper than grid electricity. Consumers can either buy a system outright or—as a popular alternative—lease the system with no upfront costs. Leasing companies like SolarCity (now part of Tesla) pioneered this approach, in which consumers agree to buy electricity from the system installed on their roof. Whether to add the extra expense of battery backup is important. A pair of Tesla Powerwalls will cost about $14,000 installed and store enough electricity to power a home for seven days. It’s suitable for people looking to go off the grid because the sun doesn’t always shine, and power generated on sunny days can be stored and used when it’s overcast. Residential wind power is in its infancy in the U.S. Off-the-grid solar is not just for those living in sun-rich states. Installers can look at a property—often remotely, through applications like Google Earth—and determine if solar is appropriate. Sometimes a few trees will have to be sacrificed, but the benefits are manifold, and not just because there will be power during grid blackouts. Wind: If the Resource is Right Wind power accounted for the largest share of renewable energy growth in 2017, reports the International Energy Agency, but it’s in its infancy for homeowners, partly due to an average cost of $48,000 to $65,000 per installed project. Residential turbines have been installed in all 50 states, but many parts of the U.S. have marginal resources. Check the Department of Energy wind resource guide for local data at WindExchange.Energy.Gov. The best-case scenario is strong winds plus few neighbors close to a large property (and lenient zoning laws). Wind may work for the 19.3 percent of the population that lives in rural areas and the 21 million American homes built on properties of an acre or more. Hydroponic systems require 90% less water and significantly less energy and space versus traditional farming practices. However, it isn’t for everyone. James Weston, of Greene, Maine, installed his turbine 10 years ago, and considers his rooftop solar panels a better investment. “By the time you put up your 100-foot tower to get the tower above the tree line and optimize the wind resource, the return isn’t there,” he says, noting that his savings from the turbine amount to a few hundred dollars a year. Bergey WindPower, maker of the 10-kilowatt BWC Excel 10 turbine ($31,770), recommends that a property have at least a 10 mph average wind speed, coupled with high electricity prices of 10 cents per kilowatt-hour or more. Also consider the neighbors: The system’s turbine is typically installed on an 80-to-100-foot tower, and so-called “viewshed” objections have taken down many projects (including Cape Wind, in Massachusetts). With annual maintenance, the DOE reports that small wind turbines should last about 20 years, the same basic lifespan as solar panels. The federal production tax credit for wind is available this year, but won’t be available afterwards. Some states offer incentives. A useful small wind guidebook can be found at WindExchange.Energy.gov/ small-wind-guidebook. piece of property. Local geology will be a factor in siting and sizing the system. Geothermal systems use underground pipes filled with refrigerant that absorbs warmth from the ground through a heat exchanger. In summer, that same underground temperature can be tapped to cool a home, combining heating and air conditioning in one system. While it necessitates a relatively high upfront cost, low operating costs mean the systems can pay for themselves in less than 10 years. Most include a ground-source heat pump with a 50-year warranty. For a 2,500-squarefoot home, an average off-the-electrical-grid system will cost $20,000 to $25,000 to install. Bill Martin, in Quincy, California, runs an efficient three-ton geothermal system installed in 2014. “It’s been a very good experience,” he says. “I’m ecstatically happy.” The same 30 percent federal tax credit that applies to solar also applies to geothermal for systems installed by 2020. States also provide incentives. A detailed guide on availability is available at Tinyurl.com/ GeothermalHeatPumpListing. udges Square, the initial project of Ameri’ca and Jason Tickle of Tickle Creative, seeks to integrate nature into the built environment. Construction has begun on the Daphne property that was once home to the iconic Judge Roy Bean, and concepts of biophilia (E.O. Wilson’s term for the need to connect people to nature for their well-being and happiness) and new urbanism are inspiring the design. While mixed-use buildings with residential flats and unique-to-market shops and eateries are part of the plan, much of the nearly two-acre property will be used for village-green style outdoor spaces. Nationally lauded for his environmentally-sensitive projects, Campion Hruby landscape architect Kevin Campion plans for more than 125 trees to accompany native plants and water features that create natural habitats alongside pathways and sidewalks connecting Montrose and Daphne. “Although we live in a highly connected and integrated world, it is easy to feel disconnected from both each other and from the natural world that surrounds us. Our vision for Judges Square is a place for community to come together,” says Jason. “A recent news story recounted a trend where doctors are prescribing vitamin-N—meaning nature—to treat anxiety issues. The movement to restore vitamin N to our built environment is a major influence on the design team behind Judges Square. We’re investing in the future of this community, investing in our children and the vitality of their environment for years to come.” For more information, visit JudgesSquare.com. See ad, page 3. Jim Motavalli, of Fairfield, CT, is an author, and freelance journalist, specializing in alternative energy, clean automotive and other environmental topics. Connect at JimMotavalli.com. AMERI'CA & JASON TICKLE OF TICKLE CREATIVE/ KATE MERCER PHOTOGRAPHY. Buildings, especially older structures, are usually sieves in terms of energy loss, so before investing in a system, check to see if the local utility provides free energy audits. Even if it’s not free, it’s worth finding out if the home needs new windows or strategically applied insulation. There are scammers in every field, and alternative energy is no exception. Ask providers for references to previous customers and check for online cautions from the Better Business Bureau, Yelp and others. Alternative energy in any form can save money and precious resources. Explore the options thoroughly and choose wisely before pulling the plug. to find a quiet spot, like the base of a tree or under a bush, and build a tiny house using only their imagination and natural materials such as sticks, bark, grass, pebbles, feathers and pinecones. “The fun is ageless and connects you to nature in magical and memorable ways,” says Tracy Kane of Maine, whose website, FairyHouses.com, offers ideas and books. in the dirt and on leaves, then ask them to draw them. Back home or at the library, kids can search in guidebooks or online to learn the critters’ names and traits. hiding place, stocked with lemonade, apples and fun books. hibiscus or hollyhock flowers and toothpicks to make dolls with flowing skirts. Or they can collect leaves of different shapes and sizes and glue them together to create leafy creatures. “You can take it an extra step by inventing a story and creating a one-of-akind storybook,” says Mateleska. hear. See if they can imitate the tweets or find words that describe them. Check out a bird-song beginner’s guide at Audubon. org/news/a-beginners-guide-common-birdsounds-and-what-they-mean. open the door into the back yard and let the kids “go at it,” as does writer Attiyya Atkins, a mother of four in Pompano Beach, Florida. “Mostly it’s self-play, but I come out sometimes and teach them about nature, or we do art projects with leaves, rocks or dirt. It’s always naturally fun, and they’re pretty tired afterwards!” Ronica A. O’Hara is a Denver-based natural health writer. Connect at OHaraRonica@ gmail.com. ALKALINE WATER ON THE GO! This portable alkaline water solution is the perfect companion for all of your outdoor adventures! Just add water & shake! 10 a.m. to noon, April 13 George Martin City Park, Gautier, MS This annual event features a farmers’ market, free eco-tours, vendors and children’s activities. Local vendors will teach about efficient, money-saving and earth-friendly practices. Additionally, a free household hazardous waste collection will be taking place the same day at Singing River Mall parking lot. For more information, visit JaxCoHome.com. 9 a.m. to 2 p.m., April 20 Coastal Alabama Farmers and Fishermens Market, Foley, AL Coastal Alabama Farmers and Fishermens Market will celebrate Earth Day with displays, live music, crafts and a yart sale (yard and art sale) at the farmers’ market. For more information, call Alescia Forland at 251-709-4469. 10 a.m. to 6 p.m., April 20 Fairhope Pier Park, Fairhope, AL Alabama’s largest Earth Day celebration hosts more than 100 environmental displays. Highlights include a children’s parade, educational activities, environmental film festival, electronics recycling and live entertainment throughout the day. Free shuttle service is provided from Big Lots parking lot, plus free valet bike parking is available at the event. For more information, call 702-496-5050 or visit EarthDayMobileBay.org. This annual celebration and educational forum promotes green lifestyles with a fun, family-friendly atmosphere. The theme is Energy, Transportation and Sustainability and vendors will represent ride sharing, public transportation, hybrid vehicles, alternative energy sources and gardening. Enjoy live music, dancing, yoga and a children’s area. For more information, call 850-293-3578 or visit EarthDayPensacola.org. BALANCE YOUR MIND & BODY WITH CBD. SHOP OUR CBD SELECTION TODAY! acred space is most often associated with places of worship, but it can be any place that connects us to meaning or joy. In the blur of daily living, nooks of inspiration and beauty provide spiritual sustenance, remind us of our dreams or celebrate lovely memories. Having “bliss corners” in the home or workplace is a wonderful way to stay connected to the positive. Most parents or grandparents can confess to having a bliss corner on the refrigerator door where drawings and accomplishments of young family members are proudly displayed. Having a place of inspiration in any room doesn’t have to take up much space and can easily add to the décor. It can be as simple as a wedding veil hanging on a bedroom wall or a bowl of shells, sea glass or sand from a beach vacation in the bathroom. It can be sentimental with dried flowers from a momentous occasion or a small table dedicated to loved ones with framed photos or letters and a piece of cloth that holds special memories. Corners of bliss fulfill their purpose best in places where they can remind us to follow our heart’s “true north” or help us to foster inner peace during busy days. Such places are office desks and bedroom nightstands near an alarm clock. The kitchen is an ideal room in the house for sacred space; designating a corner to light a candle during meal prep; filling an old teapot with fresh flowers every week; and displaying the photo of someone who once nourished us are all beautiful ways to bring more meaning into our relationship with food. Cultivating bliss can be a form of active meditation, simple rituals that can include prayer or other forms of mindfulness. On more practical levels, it can be an opportunity to bond with loved ones. Creating a bliss corner can be a creative and fun activity for teens to express a passion, whether it be a hobby, sport or favorite singer. Many of us have boxes of mementos or nostalgic things from childhood taking up space in a closet. Making a bliss corner is the perfect way to remind us why we kept them in the first place. Maya Whitman writes about natural health and living a more beautiful life. Connect at Ekstasis28@gmail.com. What are your pets trying to tell you?? Animal Communication & Counseling Resolve behavior issues and discord between household members of all species through agreeable compromise. SKINCARE ANTI-AGING MAKE-UP FEED YOUR SKIN A HEALTHY DIET. TruAura’s microbiome-friendly skincare nurtures your skin’s natural balance. simple formulas | effective products Free of gluten, parabens, sulfates, phthalates & synthetic fragrances. Malchiodi also incorporates mindfulness practices, visual arts, music and some simple forms of yoga in her sessions. that somewhere, many of us are told that creative expression must be a certain way. Creativity is a natural state, a human quality that we are born with, and the product of creation is not as important as the process.” Creativity from a clinical perspective allows for new emotional vantage points, distance from situations and viewing experiences through a different lens. “Bringing in creativity offers a wider palette of tools or access points, and gives us another way to understand ourselves,” says Meister. “Creativity as a life force is accessible to all of us.” Marlaina Donato is an author and composer. Connect at AutumnEmbersMusic.com. The Health Hut Buy Local, It Matters! Beauty Starts on the Inside. 1 per customer per transaction. Cannot be used with other discount or offer. Expires 4/30/19. Must present coupon. Dates and times may change. Please call ahead to confirm. All calendar events must be received by the 10th of the month and adhere to our guidelines. Go to HealthyLivingHealthyPlanet.com to submit entries. TUESDAY, APRIL 2 Soul Shine Yoga Beginner Series 5:30-6:30pm. New to yoga or need a refresher? In this 3-wk series, learn the principles of alignment for the most common yoga + basic breathing and meditation. Unheated. Meets on 3 consecutive Tuesdays. $49 includes unlimited yoga during series. Soul Shine Yoga, 103B N Bancroft St, Fairhope, AL. Namaste@TheSoulShineLife.com. TheSoulShineLife.com. FRIDAY, APRIL 5 Raindrop Rreflex-OIL-ogy™ 1-5pm. This 4-hr class will teach you how to effectively and intentionally apply each Raindrop Oil onto the appropriate reflexes of the feet as a natural wellness tool to use on family, friends, self and clients. 4 CEUs. Sonya’s Dance Studio, 508 E Commerce St, Greenville, AL. 850-380-4943. Contact@Reflex-OIL-ogy. com. Reflex-OIL-ogy.com. SATURDAY, APRIL 6 Reflex-OIL-ogy™ of the Skeletal System 8am-5pm. The number one most common aliment is back and joint pain. This 1-day class will empower you with natural tools including essential oil usage, stretches, reflex areas on the feet, anatomy and pathologies, emotional impact and energy flow. 8 CEUs. Sonya’s Dance Studio, 508 E Commerce St, Greenville, AL. 850-380-4943. Contact@Reflex-OIL-ogy.com. Reflex-OIL-ogy.com. Mindful Market at Thrive on 181 11am-4pm, Apr 6-7. Mindful Market offers mindful products and local vendors in the Orchard with free activities, music and other attractions throughout the day. A portion of event proceeds and market sales go to Ecumenical Ministries. Thrive Yoga & Massage, 21180 State Hwy 181, Fairhope, AL. 251-929-4020. Thrive@ThriveFairhope.com. ThriveFairhope.com. Reverse Engineer Your Yoga Poses with Sybil Nance 2-5pm. Submit your favorite or most challenging yoga postures and we’ll reverse engineer them together, building “how to” vignettes so the yoga poses will arrive in your body with more ease. $55. Advance registration required. Soul Shine Yoga, 103B N Bancroft St, Fairhope, AL. Namaste@ TheSoulShineLife.com. TheSoulShineLife.com. $5 Soul Shine Community Yoga Classes April 6, 13, 20, 27. Classes are $5 at both Fairhope and Daphne locations! Options include Foundations of Yoga, Hot Power Hour and Core Fusion Fit classes. Advance registration recommended. Soul Shine Yoga, 103B N Bancroft St, Fairhope, AL and 28623 N. Main St, Daphne, AL. Namaste@TheSoulShineLife.com. TheSoulShineLife.com. SUNDAY, APRIL 7 Prenatal Yoga Series 4:30-5:30pm, Apr 7, 14, 28. Prenatal yoga gives a woman energy to enjoy her pregnancy, serenity to build a deeper intimacy with her own body and baby, and the presence of mind to expect the unexpected and be present. $49 includes unlimited yoga during series. Soul Shine Yoga, 103B N Bancroft St, Fairhope, AL. Namaste@TheSoulShineLife.com. TheSoulShineLife.com. FRIDAY, APRIL 12 AHA Student Massage Clinic Apr 12 & 26. School-supervised internship gives opportunity for student practitioners to work with clients in a professional setting and clients to receive quality, full-length healing treatments at a great value. Call 251-753-1937 to schedule appointments at 10:15, 11:30, 12:45. $25 for 50-min full-body student massage. Alabama Healing Arts, 6304 Cottage Hill Rd, Mobile, AL. AlabamaHealingArts.com. SATURDAY, APRIL 13 Easter Egg-Stravaganza Sale 10am-2pm. Uptail Resale, the official resale shop of the Baldwin Humane Society, is hosting this sale where customers will choose an egg to win a discount for marked products. New inventory posted on Facebook. All proceeds benefit Baldwin Humane Society. 22886-D US Hwy 98, Fairhope, AL. 251-928-8020. Facebook.com/UptailResale. The Joy of Yoga with Sybil Nance 2-6pm. This playful workshop is guaranteed to do a little karmic spring cleaning. Yoga, breathwork, mantra, philosophy and guided meditation. Advanced registration required. $55. Blue Sky Collective, 265 Young St, Fairhope, AL. BlueSkyFairhope.com. WEDNESDAY, APRIL 17 Green Drinks Mobile 5-7pm. Join us for an informal yet engaging happy hour with like-minded folks and a monthly speaker every third Wednesday. Free to attend except the cost of your drinks. Alchemy Tavern, 7 South Joachim St., Mobile, AL. MobileBayGreenDrinks@gmail.com. Facebook.com/MobileBayGreenDrinks. Weeks Bay Plantation’s Harvest Night 9am: Organic blueberry picking and kids activities begin. 4-8pm: Live entertainment, food trucks and marketplace. Bring the whole family to spend the day at Weeks Bay Plantation! BYOB, bring chair/ blanket. $10 per event (kids 12 and under get in free) or purchase a Friend of the Farm Pass for $20 and gain access to all three Harvest Nights. Jessica@ WeeksBayPlantation.com. WeeksBayPlantation.com. Learn about Labyrinths Healing Acres has 2 outdoor labyrinths that are open to the public. Learn the history of labyrinths and how to use them. Find us on Facebook for a full list of wellness and gardening classes. Healing Acres, 22355 Price Grubbs Rd., Robertsdale, AL. 251-300-9052. Earth Day Mobile Bay 10am. Alabama’s largest Earth Day celebration. Free. Fairhope Pier Park, Fairhope. EarthDayMobileBay.org. THURSDAY, APRIL 25 Essential Oils for Animals 7-9:50pm. Do you consider your pets family? Of course you do! Tonya Halterman’s horses are her family and therapists as she helps Autistic children. Come join us to discover how you can support and enrich the lives of your pets with essential oils. Bay Branch Estates, 28347 Turkey Branch Dr, Daphne, AL. 850-380-4943. LaurieAzzarella@gmail.com. Reflex-OIL-ogy.com. SATURDAY, APRIL 27 AHA Reiki Certification Training Offered tri-annually. Upon completion, which begins with the Level I Usui Ryoho Reiki training, participants can perform self-treatments and practice professionally. Each of the three levels may be purchased individually, and for continuing education. For more details or application: AlabamaHealingArts@gmail. com. Alabama Healing Arts, 6304 Cottage Hill Rd, Mobile, AL. AlabamaHealingArts.com. Spring/Summer Market in the Park Opening Day 7:30am-12pm. The downtown Spring/Summer market will be open Saturdays, Apr 27-Jul 27. Local produce, baked goods, honey, flowers, soaps, live music and more. Cathedral Square, Mobile, AL. 251-208-1550. SpecialEventsMobile.org. Reflex-OIL-ogy™ of the Endocrine System 8am-5pm. Your hormones affect all aspects of your health: digestion, sleep, weight, muscle, skin, bone health, sexual function and more. Learn how to effectively balance your hormones using essential oils on the reflex areas of your feet and hands. 8 CEUs. The Shoppe Restoration & Wellness, 4363 5th Ave, Pace, FL. 850-380-4943. Contact@ Reflex-OILogy.com. Reflex-OIL-ogy.com. Food Preservation Class Learn how to preserve food from the garden. Find us on Facebook for a full list of wellness and gardening classes. Healing Acres, 22355 Price Grubbs Rd., Robertsdale, AL. 251-300-9052. Blue Boy Herb Festival Apr 27-28. A semi-annual herb festival with local herbalist extraordinaire Darrell Martin. Carriere, MS. 1-800-798-9951. Blue.Boy@datastar.net. BlueBoyHerbs.com. SATURDAY, MAY 4 Holistic Health Practitioner Certification Certify as a naturopathic practitioner. Learn the basics of herbalism, aromatherapy and natural therapies for common complaints. Study natural cancer support, meditation and more. Meets 1 Saturday a month for 12 months. Southern Institute of Natural Health, Ocean Springs, MS. 228-257-1946. Admin@SouthernInstituteOfNaturalHealth.com. SouthernInstituteOfNaturalHealth.com. SATURDAY, MAY 11 The Good Life Ride Scenic ride in Coastal Alabama using the trails of Gulf State Park. 3 routes offered—2, 9 and 19 mile options. Starts and finishes at The Lodge at Gulf State Park. Registration includes ride plus food and drinks at the after-party. Proceeds benefit a bicycle safety campaign. 251-990-6002. GoodLifeRide.org. SATURDAY, MAY 18 Weeks Bay Plantation’s Harvest Night 9am: Organic blueberry picking and kids activities begin. 4-8pm: Live entertainment, food trucks and marketplace. Bring the whole family to spend the day at Weeks Bay Plantation! BYOB, bring chair/ blanket. $10 per event (kids 12 and under get in free) or purchase a Friend of the Farm Pass for $20 and gain access to all three Harvest Nights. Jessica@ WeeksBayPlantation.com. WeeksBayPlantation.com. THURSDAY, MAY 30 Spring/Summer Market in the Park Opening Day 3-6pm. The Spring/Summer market will be open Thursdays, May 30-Aug 1. Local produce, baked goods, honey, flowers, soaps, live music and more. Lavretta Park, Old Shell Rd, Mobile, AL. 251-208-1550. SpecialEventsMobile.org. MONDAY, JULY 8 AHA Massage Therapy School Scheduled start date for the 650-hour program. Curriculum meets state requirements to prepare students as licensed therapists. Emphasizes hands-on techniques and practice, specialty techniques, fundamental sciences, student clinic and outreach practicum. AHA maintains a 100% pass rate for students taking licensure exam. For details or application: AlabamaHealingArts@gmail. com. Alabama Healing Arts, 6304 Cottage Hill Rd, Mobile, AL. AlabamaHealingArts.com. SATURDAY, JULY 13 AHA Yoga Teacher Training Scheduled start date for the 200-, 300- & 500-hour yoga teacher trainings. Available for aspiring teachers or personal development. Eclectic training with emphasis on Iyengar-style instruction and utilization of props to ensure safety and alignment. Graduates are eligible to become registered with Yoga Alliance. For details: AlabamaHealingArts@gmail. com. Alabama Healing Arts, 6304 Cottage Hill Rd, Mobile, AL. AlabamaHealingArts.com. ongoing calendar SUNDAYS Discounts on Supplements Every Sunday get 15% off supplements at Fairhope Health Foods (251-928-0644) and Virginia’s Health Foods (251-479-3952). 280 Eastern Shore Shopping Center, Fairhope, AL and 3055-A Dauphin St, Mobile, AL. VA-FairhopeHealthFoods.com. Open Table Worship Service (United Church of Christ) 10:30am. Weekly progressive Christian worship. Gathering in the chapel at All Saints Episcopal Church, 151 S Ann St, Mobile, AL. 251-545-1011. Pastor@OpenTableUCC.org. OpenTableUCC.org. Sunday Service 10:30am. Explore a spiritual pathway with Mobile Unitarian Universalists, 6345 Old Shell Rd, Mobile, AL. UUFM.org. Sunday Service at Unity Church of Gulfport 10:30-11:45am. Join us for a spiritual message given by Rev. Judy Voght. Let her inspire your week ahead with uplifting, positive messages from the heart. Join us every third Sunday, after service, for fellowship potluck. Unity Church of Gulfport, 1700 E Railroad St, Gulfport, MS. 228-871-7004. JanBixler@gmail.com. UnityGulfport.com. Unity Sunday Service and Celebration 10:30am. Weekly service welcomes people of all races, cultures, lifestyles and creeds. Services followed by cake and coffee for birthdays on 1st Sundays, eating out together 2nd Sundays, potluck and fellowship 3rd Sundays, healing circle/pet blessing 4th Sundays, Q&A and eat out 5th Sundays. Unity on the Eastern Shore, 22979 US Hwy 98, Fairhope, AL. 251-9908934. UnityEasternShore.WixSite.com/unity. Fairhope Unitarian Sunday Service 11am-12pm. Our Sunday services feature a different guest speaker each week, either a member of our congregation or someone from the surrounding community. We address a variety of topics, from literature and history to religious thought and social issues. Fairhope Unitarian Fellowship, 1150 Fairhope Ave, Fairhope, AL. FairhopeUnitarianFellowship@ gmail.com. FairhopeUU.org. Unity Church of Mobile Sunday Service 11am. Unity offers a positive path for spiritual living. Join us on Sundays for a peace-filled experience, and joyous fellowship, with uplifting messages and music, and centering meditations. 5859 Cottage Hill Rd, Mobile, AL. 251-285-3440. UnityOfMobileAL@ gmail.com. Facebook.com/unityofmobile. Baha’i’s of Fairhope Diversity Devotions 3-5pm. Every 4th Sunday. Join us in the coming together of people from diverse religions and backgrounds to celebrate our unity and strengthen the spiritual health of the community. Refreshments served immediately following the shared devotional program. 81 Magnolia Ave, Fairhope, AL. BahaisOfFairhope@gmail.com. Ecstatic Dance 4:30-6pm. We bring community together to dance, breathe, sweat and celebrate in a supportive and fun environment which facilitates personal empowerment, conscious connection and deep transformation. Suggested donation $15. Blue Sky, 265 Young St, Fairhope, AL. 251-929-4634. Counseling@RebeccaWashburn. com. Facebook.com/EcstaticDanceFairhope/. MONDAYS Gentle Yoga with Dana 4:15-5:15pm. Join Dana for a calming yoga class to ease your stress and both soothe and quiet your mind. Find your bliss in the land of “ahhhhs”. Leave feeling on top of the world and really enjoy the splendor of the day. Synergy Yoga & Pilates, Mobile, AL. 251-473-1104. Synergyoga.net. Doggie Happy Hour 5-7pm. 1st Mon. A rescue networking event hosted by My Happy Dog 123. Bring your dog for drinks and live music while raising money for a local rescue foundation. Q&A with local vets. Free grainfree dog treats. Raffle prizes. Puppy photo booth. Free. OK Bicycle Shop, 661 Dauphin St, Mobile, AL. Viviane Hentschel: MyHappyDog123@gmail. com. Facebook.com/myhappydog123. Please call ahead to confirm dates and times. classifieds Fee for classified listings is $1 per word. Volunteer opportunities are listed for free as space is available. 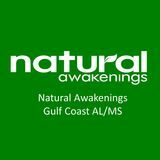 OPPORTUNITIES BECOME A PUBLISHER – Natural Awakenings Gulf Coast AL/MS is for sale. Homebased business opportunity. No publishing experience required. See ad, page 2. FRANCHISE OPPORTUNITY– OsteoStrong is looking for motivated, healthconscious individuals to open new franchises in Alabama. Our proven system for success offers an exceptional business opportunity. More info: 251-210-6955; OsteoStrong.me. SERVICES UNIVERSAL GUIDANCE - Consult Spirit Guides, Masters of the Universe and departed loved ones. Ask questions, get answers to transform your life. Betsey Grady: 251752-6509. MONDAYS CONTINUED Vinyasa Flow 5:30-6:30pm. A dynamic style of yoga which joins physical postures (asanas) and breathing. Class is usually set to music. Vinyasa builds strength, flexibility and focus, while cleansing the body and calming the mind. CryoYoga, 12 N Section St, Fairhope, AL. 256826-4140. Support@CryoYoga.com. CryoYoga.com. Responsible Parenting Class 6-8pm. Free course for parents, together or separate, that covers co-parenting issues, positive parenting methods, money management and economic stability. Open to parents of children 18 and under. Also taught on Wednesday mornings. Family Center Baldwin County, 22671 Hwy 59 S, Robertsdale, AL. 251-947-4700. BaldwinFamilies2@gmail.com. FamilyCenterMobile.org. TUESDAYS 10% Off Facials Tues & Thurs. Book your appointments at Wellness Spa of Ocean Springs on Tuesdays and Thursdays and receive 10% off of any facial treatment or microdermabrasion when you mention this listing. Excludes any other offers, coupons or specials. 2900 Government St, Ocean Springs, MS. 228-209-4090. WellnessSpaOS.com. Slow Flow Yoga with Anna-Marie 8:15-9:15am. Enjoy Anna-Marie Babington’s zest, grace and refreshing energy as she puts you back in touch with your body, restores the mind and leaves you refreshed, energized, and focused. Revel in the bliss and embrace the joy as you start the day. Synergy Yoga & Pilates, Mobile, AL. 251-473-1104. Synergyoga.net. Positive Parenting Classes 9-11:30am. 8-week course focused on parenting techniques that work without using corporal punishment. Also taught in our Baldwin County office as well as Mobile on Thursdays 9-11:30am. The Family Center, 22671 Hwy 59 S, Robertsdale, AL. 251-947-4700. Kids101@comcast.net. FamilyCenterMobile.org. Akashic Records in Fairhope 9:30am-6pm. Akashic Records sessions in-person with Betsey Grady: 30 min, 60 min, couples sessions available. Seek guidance. Connect with departed loved ones. Achieve clarity. Leave soothed, inspired and uplifted. 400 Fairhope Ave, Suite 2G, Fairhope, AL. 251-752-6509. BetseyGrady.com. Grief Recovery Meeting 1-2:30pm. This is a Christian-based grief recovery program for all losses. Experienced, professional and compassionate staff members support you through the grief process with the goal of transitioning into a renewed life of purpose and fulfillment. Ascension Funerals & Cremations, 1016 Hillcrest Rd, Mobile, AL. 251-634-8055. AscensionFuneralGroup.com. Farmers Market 10am-3pm, Nov-Mar. 2-6pm, Apr-Oct. Farmers market offering direct farm sales to the public. Fresh seasonal produce, meat, eggs, honey, jellies, baked goods, handcrafted soaps and local artistry. Open Tuesdays and Saturdays year round. Coastal Alabama Farmers and Fishermens Market, 20733 Miflin Rd, Foley, AL. 251-709-4469. FoleyMarketMgr@gmail. com. CoastalAlabamaMarket.com. Gentle Yoga with Rhonda Jones 12-1pm. A stressful morning? We can fix that! Join Rhonda Jones in the land of “ahhhhs” for a relaxing hour long gentle yoga class to soothe the spirit, calm the mind and replenish the soul—leave class refreshed and focused. Also with Virginia on Thursdays. Synergy Yoga & Pilates, Mobile, AL. 251-473-1104. Synergyoga.net. AHA PM Iyengar-Style Yoga 5:45pm. Tues & Thurs. This centering tune-up improves posture, muscle-tone, strength and flexibility. Beginner-friendly. Props provided. Register: call/text 251-377-8940 for Tues; 251-382-7895 for Thurs. $10/class; $50/6-class pass; $100/12-class pass. Alabama Healing Arts, 6304 Cottage Hill Rd, Mobile, AL. AlabamaHealingArts.com. Outstretched Christ-Centered Yoga Class 5:45pm. Also at 8:15am on Wed. Each week Pneuma offers two donation-only yoga classes open to the public. Classes are appropriate for all levels and include a Christ-centered devotion. Donation only. 1901 Main St, Daphne, AL. More info: PneumaYogaStudio.com. doTERRA Oil Classes 6-7pm. Learn how to use essential oils at Avalon. Find us on Facebook for more wellness and gardening classes. Avalon Education & Wellness Center, 19260 Co. Rd. 64, Loxley, AL. 251-300-9052. Sierra Club Meeting 6-8pm. 1st Tues. Public welcome. 5 Rivers Delta Resource Center, Spanish Fort, AL. Pet Loss Support Group 6:30-7:30pm. Every 1st Tues. Support group for those grieving the loss of a beloved pet, a grief most people don’t recognize or understand. This is a free, confidential and safe group—all of us have been in your shoes. Unable to attend? Phone sessions available. Dr. Lynne Lohmeier: 228-4971394. LohmeierLynne@gmail.com. Ocean Springs Library, 525 Dewey Ave, Ocean Springs, MS. PM Tai Chi Class 6:30-7:45pm. Join Master Jude Forsyth for this beginning Qigong Tai Chi class to explore how the ancient moving meditation can make a difference for you. Class fees range from $10-$12. Central Presbyterian Church, 1260 Dauphin St, Mobile, AL. 251-207-0007. Jude@BlueWillowWellness. com. BlueWillowWellness.com. MELT Method Class 9-9:30am. Learn simple MELT self-treatments you can do to remain active, healthy and pain-free for life. Eliminate “stuck” stress before it accumulates causing chronic aches, pains and unwanted signs of aging. Keep your whole body feeling great at any age. Synergy Yoga & Pilates, Mobile, AL. 251-473-1104. Synergyoga.net. AHA AM Iyengar-Style Yoga 9:30am. This class emphasizes detailed instruction and proper body alignment, utilizes the aid of props when needed, to improve posture, muscle-tone, strength and flexibility. Call/text 251-753-1937 to register. $10/ class; $50/6-class pass;$100/12-class pass. Alabama Healing Arts, 6304 Cottage Hill Rd, Mobile, AL. AlabamaHealingArts.com. Free Chair Yoga for MS 10:30-11:30am. The MS Foundation provides one free yoga class a week at Thrive Yoga & Massage. Most members of the Fairhope MS support group come on Wed at 10:30 am. Fill out a couple forms with your doctor to attend. Thrive Yoga & Massage, 21180 Alabama 181, Fairhope, AL. 251-929-4020. Thrive@ThriveFairhope.com. ThriveFairhope.com. Green Drinks Mobile 5-7pm. 3rd Wed. Join us for an informal yet engaging happy hour with like-minded folks and monthly speaker at most meetings. Connect with other progressive people in our area. Free to attend except the cost of your drinks. Alchemy Tavern, 7 S Joachim St, Mobile, AL. MobileBayGreenDrinks@gmail. com. Facebook.com/MobileBayGreenDrinks. Eastern Shore MS Support Group 5:30pm. 2nd Wed. Eastern Shore MS Support Group meets each month at Ruby Tuesday in Fairhope, AL. Family, friends and caregivers are always welcome. Weezer: 251-928-7606. Near Death (NDEs) and Related Experiences 6pm. 2nd Wed. Mobile affiliate group of IANDS. All are welcome to share experiences and support. Free. West Regional Branch, Mobile Public Library, Grelot Rd (near University Blvd), Mobile, AL. 251340-8565. Lbrlumin@aol.com. IANDS.org. THURSDAYS Gulf Coast Herb Society 10am-12pm, 2nd Thursdays. Meetings explore herbalism, and in particular, native medicinal herbs. Speakers/topics vary each month. The Nourishing Place, 606 Tennessee St, Gulfport, MS. More info: HIITMom3@gmail.com. Akashic Records in Mobile 10:30am-5pm, every Thursday. Akashic Records sessions in-person with Betsey Grady: 30 min, 60 min, couples sessions available. Seek guidance. Connect with departed loved ones. Achieve clarity. Leave soothed, inspired and uplifted. Simply Life Learning Center, 2065 Old Shell Rd, Mobile, AL. 251-752-6509. BetseyGrady.com. Agape Food Truck 11am-1:15pm. Enjoy Agape’s cold-pressed juices, smoothies and snacks for a healthy lunch option on the go. Don’t panic, it’s organic! Columbia Southern University, Orange Beach, AL. 251-979-6201. Agape-Juices.com. Market in the Park Springhill 3-6pm. May 23-Aug 1. Local produce, baked goods, honey, flowers, soaps, live music and more. Lavretta Park, Old Shell Rd, Mobile, AL. 251-2081550. SpecialEventsMobile.org. Aerial Flow 5:45-6:45pm. Our aerial yoga class creates a space for fun and engaging movements to help you use the silks to build strength, flexibility and learn some fun skills and tricks. Some previous experience in the silks will be helpful but all are welcome. CryoYoga, 12 N Section St, Fairhope, AL. 256-826-4140. Support@ CryoYoga.com. CryoYoga.com. AHA PM Iyengar-StyleYoga 5:45pm. Tues & Thurs. This centering, end-of-the-week tune-up improves posture, muscle-tone, strength & flexibility. Beginner-friendly. Props provided. Register: call/ text 251-382-7895. $10/class; $50/6-class pass;$100/12class pass. Alabama Healing Arts, 6304 Cottage Hill Rd, Mobile, AL. AlabamaHealingArts.com. Yoga with Chris McFadyen 5:45-7pm. Chris McFadyen is back! Join him for some energizing yoga as his breath work, asana and flow calms the mind and also enhances and refocuses the body. Relocate your passion and find your humor after a long day. Synergy Yoga & Pilates, Mobile, AL. 251-473-1104. Synergyoga.net. Group Reformer Class 6-7pm. Catch the wave of classical fitness and join Adrienne at the end of your day for a Pilates group reformer class. Stand taller, get toned and be both leaner and stronger. Leave class feeling great! Please log onto the website to make reservations. Synergy Yoga & Pilates, Mobile, AL. 251-473-1104. Synergyoga.net. Personal Wellness and Self-Discovery Classes 6:30pm. Every last Thurs. Monthly classes designed to empower oneself to heal, uplift and detoxify the body, mind and spirit. Daphne, AL. 850-380-4943. LaurieAzzarella@gmail.com. Laurie.MarketingScents.com. Saturday Morning Yoga with Augusta 7:30-8:45am. All levels. The movements will challenge you to stay mindful and your mindfulness will allow you to honor your limits without judging yourself. $15 drop-in. $10 students and instructors. Creative Outlet, 66 1/2 S Section St, Fairhope, AL. 251-928-5363. HeartStringsYoga.com. Farmers Market 9am-2pm. Farmers market offering direct farm sales to the public. Fresh seasonal produce, meat, eggs, honey, jellies, baked goods, handcrafted soaps and local artistry. Open Tuesdays and Saturdays year round. Coastal Alabama Farmers and Fishermens Market, 20733 Miflin Rd, Foley, AL. 251-709-4469. FoleyMarketMgr@gmail.com. CoastalAlabamaMarket.com. Friday Morning Serial 8-9am. A weekly public gathering and networking event featuring a 10-15 min speaker and group discussion. Topics, speakers and attendees are from diverse backgrounds and provide specialized insight. Free. Gulf Coast Community Design Studio, 769 Howard Ave, Biloxi, MS. 228-436-4661. GCCDS.org. Sunset Yoga for Charity 2nd & 4th Fridays, Mar-Oct. 11th annual Sunset Yoga season. A different teacher for a different charity every Start time depending on sunset time. Bring your mat, your donation and a friend. The Bluff (1 Beach Rd), Fairhope, AL. Rain site: Thrive Yoga and Massage, 21180 Hwy 181. 251-929-4020. Thrive@ ThriveFairhope.com. ThriveFairhope.com. SATURDAY Market in the Park Downtown 7:30am-12pm. Apr 27-Jul 27; Oct 12-Nov 23. Local produce, baked goods, honey, flowers, soaps, live music and more. Cathedral Square, Mobile, AL. 251208-1550. SpecialEventsMobile.org. GROW Your Business Contact us today to learn about our comprehensive marketing campaigns. Majestic Mindfulness & Meditation 1-3pm. 1st Saturdays. We meet to practice mindfulness and meditation. Our sessions are fun and enlightening. Our flow is natural and creative. We believe our 2019 dreams and desires shall manifest thru mindfulness and meditation. RSVP a must. $5. Blue Sky, 265 Young St, Fairhope, AL. 931-982-2226. DvoraPower59@gmail.com. QuietMomentsOfHealingMeditation.Weebly.com. Weekend Yoga 9-10:15am. Join Chris M, Rhonda, Valerie or Jill and begin your weekend with a revitalizing and bliss inducing yoga class. Refresh and renew the spirit—bring the joy and zest back as you kick start your weekend. Check the website to see who is teaching. Synergy Yoga & Pilates, Mobile, AL. 251-473-1104. Synergyoga.net. Connecting you to the local leaders in natural and green living. To find out how you can be included in the Natural Directory email Publisher@ HealthyLivingHealthyPlanet.com or call 251-990-9552. Have you picked up the 2019 Healthy & Green Living Directory issue? Contact us to find out where you can pick up a copy of this expanded edition or read it online at HealthyLivingHealthyPlanet.com. Akashic Records Consultant 251-752-6509 • BetseyGrady.com Betsey@BetseyGrady.com From a soul’s inception, all of its experiences are recorded in the Akasha. Make time to explore your Akashic Records for clarity, understanding, inspiration and guidance. Seek guidance. Get answers. Connect with departed loved ones. See ad, page 21. Old Government, Mobile: 251-607-6666 2101 Hwy. 98, Daphne: 251-725-4334 TMACsHairStudio.com A relaxing salon environment that is free of harmful chemicals, impurities and fragrance. Offering hair services, facials and massage with 100% organic products. See ad, page 21. Karen Watson, Founding Consultant Daphne, AL • 256-508-0389 TruAuraBeauty.com/trubeauty4u A clean and effective line of skincare, anti-aging products and make-up that nurtures y o u r s k i n ’s n a t u r a l balance. Contact us for a complementary skincare and makeup consultation. See ad, page 29. Locations in Foley, Fairhope and Mobile, AL 251-990-0535 AscentAudiologyFairhope.com Hearing loss affects everyone uniquely which is why we solve hearing problems one individual at a time. We have the knowledge and technology to guide you on a journey to better hearing. See ad, page 17. A salon offering organic products and services SALON including hair color and shampoo. Make a difference today in your hair, your life and the Earth. Visit us for a free hair exam today and go organic! See ad, page 5. Carolyn Olson, Certified Thermographer Gulf Coast Locations from LA to FL 251-623-2225 ThermographyAdvantage.com FDA registered thermography (digital infrared thermal imaging) offers breast screenings that are non-invasive and radiation-free, without compression or bodily contact. Valuable for detecting early stage breast disease and more. See ad, page 9. 12100 Hwy. 49, Ste. 730, Gulfport, MS 228-831-1785 CoastHealthAndNutrition.com A comprehensive health food store offering several brands of CBD products in a range of applications. Visit us to learn more about how CBD can support your healthy lifestyle. See ad, page 29. 809 Gulf Shores Pkwy. Gulf Shores, AL 251-948-7862 Offering full spectrum hemp extract CBD that helps insomnia, inflammation, etc. Lotions, potions, extracts and edibles. Open 7 days a week. Mail orders available. 12% off with coupon from ad. See ad, page 17. Welcoming people of any age, race, gender identity, sexual orientation, socioeconomic status or cultural background. We seek truth and knowledge, care for the Earth and show kindness to others while creating an atmosphere of love. Join our gathering of people from diverse religions and backgrounds to celebrate unity and support the spiritual health of the community. Meeting every fourth Sunday. Contact us to learn more. 12 N. Section St., Fairhope, AL 256-826-4140 Support@CryoYoga.com Offering whole body cryotherapy in a Cryo Arctic chamber, weekly yoga classes and a community venue. 2-3 minutes of cryotherapy increases energy, focus and flexibility. See ad, page 16. Healing Acres, Robertsdale, AL 205-283-2743 MyDoterra.com/donnalewis Offering therapeutic massages, oil treatments, Zyto scans and classes with doTERRA essential oils for healthy living. 20+ years of essential oil knowledge. 17 years of massage therapy experience. See ad, page 27. Our non-invasive, drug-free approach helps dementia patients that originally scored in the teens on the Montreal Cognitive Assessment be restored to the point of scoring normal (26-30). See ad, page 4. IAOMT Protocol 225 W. Laurel Ave., Foley, AL 251-943-2471 • DrDaytonHart.com Free book for new patients: Mercury Free Dentistry. Offering ozone; laser (no-suture) gum surgery; testing for compatible materials and cavity-causing bacteria; examine for gum disease and bacteria; laser cavity diagnoses; saliva pH check; oral galvanic screening; no fluoride. See ad, page 9. Offering Deep Transcranial Magnetic Stimulation (Brainsway-a proven tool in the fight against depression that is non-invasive, painless and drug-free) with functional medicine and brain pathway rehabilitation for the most robust changes possible. See ad, page 4. Experience the healing, uplifting and detoxifying benefits of authentic, genuine therapeutic grade essential oils and supplements. Contact us for personal Zyto Wellness readings and wholesale privileges. Wellness classes on last Thursday of the month. See ad, page 31. 12562 Mary Ann Beach Rd., Fairhope, AL 251-279-8745 WeeksBayPlantation.com Weeks Bay Plantation is the regional destination of choice for pick-your-own blueberries, herbs and heirloom tomatoes—all organically grown. Check Facebook or contact us for greenhouse produce sales and Spring picking dates. Juice and Smoothie Café 7369 Alamo Cir., Ste C, Gulf Shores, AL 251-979-6201 • Agape-Juices.com Combining the finest ingredients to create fresh and healthy juices, smoothies and snacks. Don’t panic, it’s organic! Visit our café or find our food truck (follow us on Facebook for event schedule). See ad, page 21. 280 Eastern Shore Shopping Center 251-928-0644 • Café: 251-929-0055 Va-FairhopeHealthFoods.com Comprehensive health food store and organic café serving the public for 40 years. Extensive supplement selection; organic groceries, produce and meats; bath and body products; bulk bins; pet supplies; baby products and more. See ad, page 15. 2032 Airport, Mobile: 251-473-0277 680 S. Schillinger, Mobile: 251-633-0485 6845 Hwy. 90, Daphne: 251-621-1865 For 30 years The Health Hut has been the go-to place for high quality, whole-food vitamins, herbs and sport supplements at great prices. Serviceoriented, knowledgeable staff. See ad, page 31. Comprehensive health food store and organic café serving the public for 40 years. Extensive supplement selection; organic groceries, produce and meats; bath and body products; bulk bins; pet supplies; baby products and more. See ad, page 15. Open year round Tu e s d a y s ( 10am3 p m , N o v - M a r. 2-6pm, Apr-Oct. ) and Saturdays (9am2pm). Local farms with seasonal produce, meat, eggs, honey, jellies, baked goods, seafood, hand-crafted soaps and more. Follow us! Facebook, Twitter, Instagram, Pinterest. 28170 N. Main St., Ste. C, Daphne, AL (French doors on side of building) 251-616-4201 • FB.me/jubileehealingarts JubileeHealingArts.com Intuitive integrative massage techniques are used to facilitate the body into a state of healing without the “no pain no gain” mentality. Over 15 years experience in the bodywork and natural wellness field. 38 Pass Rd., Ste. C, Gulfport, MS 228-575-8660 SpencerChiropractic.com Offering K•Laser—a drug-free and painless treatment that is proven to be 90% effective in treating neuropathy symptoms such as pain, numbness, burning, tingling and loss of feeling. See ad, back cover. Rolfing® is a holistic approach to manual therapy that seeks to improve your health and function by reestablishing the natural alignment and structural integration of the human body. More information at EasternShoreRolfing.com. See ad, page 17. Boost your immune system with locally-made, natural Elderberry products including syrup, hand sanitizer and bath products. Also offering arnica products for pain relief and seasonal produce. See ad, page 11. A progressive school for pre-K through 4th grade that utilizes hands-on activities, small class sizes and inquiry-based learning, to guide students to find answers to their questions. See ad, page 27. 251-928-8020 22886-D US Hwy. 98, Fairhope, AL Facebook.com/UptailResale Uptail Resale is an upscale thrift shop whose proceeds benefit the animals of the Baldwin Humane Society. We carry quality household items, furniture and jewelry. Offering cleansing infrared sauna sessions followed by a hydrating collagen shower and detoxifying foot spas. Ask about memberhip packages. See ad, page 27. 22355 Price Grubbs Rd., Robertsdale, AL 251-300-9052 HealingAcres1@gmail.com Experience wellness with massage, reflexology, body treatments, Reiki, colonics, essential oils, wellness classes and more. Our labyrinth is open to the public during daylight hours. See ad, page 27. YOGA MASTERS OF YOGA See ads, page 16. Make an appointment today, and experience the difference.